We live not far from where my oldest attends kindergarten. Usually I pick him up in carpool each afternoon but sometimes he rides the bus home. I always put a note in his bag for the teacher specifying how he's getting home and remind him when I drop him off in the morning. "I'm picking you up tonight" I'll say, or "Don't forget you're riding the bus home." Seems simple enough, right? Yet, twice this year I've gotten a call from the school office that he's gone to carpool instead of getting on the bus and I've had to go pick him up. Once it was because the teacher got my note mixed up with a note from another day and once my son left the classroom for the bus but ended up in carpool and the teachers running the carpool were none the wiser. Until I didn't show up, that is. Not a big deal, but stressful in the end. So I decided to add an extra reminder for my son--a transportation clip on his bag. "B" and a yellow school bus for riding the bus home. "C" and a blue car for carpool. I keep the clips by the back door so that as we leave the house in the morning I can attach the right clip to his bag. I made both of these in under a half hour and for a few dollars. You might already have most of the supplies in your house and if your kids are older and craft savvy they could make these themselves. Here are the supplies: two keychain clips, a length of craft cord and assorted plastic beads and vehicle/school themed buttons. Just cut a longish length of the craft cord and knot it around the metal keychain loop (less than a dollar at Home Depot). Add the car, bus and letter buttons (purchased at Michael's Crafts) and plastic beads (I had some in my craft bin), tying a knot in between each item and ending with the car/bus. The vehicle buttons hide the last knots well. Use scissors to trim off any excess cord. Thanks to Kelley at The Grant Life for featuring my Crockpot Cranberry Portabella Mushroom Meatballs recipe last Friday. I've been out of town at a writers conference and am just getting back. I'll have some new recipes posted soon. Thanks Kelley! Thanks to Carrie over at Creative Home for sharing the Liebster Blog award with Feeding Four. The award is intended to support bloggers with fewer than 200 followers. 1.) Thank the giver and link back to his/her blog. 2.) Pass the award on to five more distinguished blogs with 200 or fewer followers. 3.) Copy and paste the above artwork and post about the award on his/her blog. 1.) Business. Blueprints. Brides. Courtney and Dana are good friends of mine who also happen to run a wedding planning business called C&D Events. They post to their blog almost daily with great tips for planning large events (even if you're not planning to get married any time soon), DIY projects, floral arrangements, crafts etc. Plus you can read all the drama behind building a wedding planning empire. 2.) My Road to Savings. I found Erika's blog on a linky party. Right away I connected with her balance of good taste, good health and good sense. I've pinned her Bacon and Pea Pasta and Honey Balsamic Chicken. 3.) A Day in the Life. Yummy recipes. Great photos of cute kids and family anecdotes and stories. What's not to love? 4.) Cakeballs, Cookies & More. The "more" includes yummy recipes for Irish Cream Glazed Doughnuts and Mudside Cupcakes In a Jar. Oh yeah. 5.) Covered in Modge Podge. I want to be Michaela when I grow up. It's that simple. Her craft projects are incredibly thoughtful and adorable. Check out this Big Brother Fort Kit. I bet she's the favorite aunt. Thanks to Natasha at Serenity You for featuring my Mudroom Makeover. Check out her great blog and join her linky party each Saturday. She's so close to reaching her goal of 100 entries! This is a comfort food coma-in-a-crock-pot kind of meal but with way fewer calories, sodium and fat. Meatballs in a velvety mushroom-cranberry sauce with tender portabella mushrooms, served in a nest of cheesy smashed red potatoes.Yum. You've noticed that I've been creating a lot of crockpot meals lately? No, this isn't becoming a crockpot recipe blog. I'm just re-discovering ways to cut down my cooking time (like using my crock pot, my bread machine, and freezer meals) while still making healthy, inexpensive, satisfying meals for my family. And, of course, passing on my re-discoveries to all of you. 1.) In a saucepan heat the cranberry jelly until it starts to look more liquid. Add the soup and stir together. 2.) Place all of the other ingredients in a crockpot. Pour the cranberry sauce over top. 3.) Cook the meatballs on low for 5 or 6 hours until the onions are tender. 1.) Boil the potatoes until tender. Drain. 2.) Smash the potatoes with a potato masher or fork leaving large chunks. 3.) Add spread, sour cream, cheese and season with salt and pepper to taste. Continue to mash together until combined. I like to leave big, tender lumps of potato. Scoop out a serving of mashed potatoes and use a large spoon to press down the center into a "bowl" shape. Spoon meatballs and sauce over top. Serve with steamed corn or other veggie or salad. Enjoy! Man, what a day. Baby is crying. Phone won't stop ringing--and it's never good news. Hormones are raging. Wait a minute, this is starting to sound like I'm channeling Adele. What's a girl to do but grab a cold glass of milk and a couple of these guys and remember all I have to be thankful for. "Bless the Lord O my soul and all that is within me, bless His holy name. 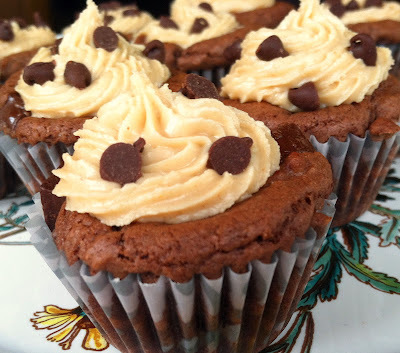 Who satisfies your years with good things..."
Hope that encourages someone else today, and hope these Mini Chocolate Chunk Cups with Peanut Butter Frosting bring a smile to your face. 1.) Make the cookies as per the instructions on the package. Scoop the cookie dough into 24 lined, mini-muffin cups. 2.) Bake for 10 minutes until set. 3.) While still hot press a spoon into the center of the cookie to form a shallow well. Let cool completely on wire racks. 4.) In a separate bowl combine the frosting ingredients. You can beat them with a mixer or do this by hand until the frosting is smooth. I added the confectioner sugar in batches and I believe it was about 2 cups total. Eyeball the sugar a little if you want the frosting thicker or thinner. 6.) Frost the cooled chocolate cups and press a few mini chocolate chips on top for good measure. Store, covered, in the fridge. Not sure how long these will keep. I'm betting not long if you have a pulse. This post entered at Serendity and Spice and these other great linky parties.